I have a place in my heart for macaroni and cheese. There is nothing better that scooping soft macaroni cheese thought a golden crust and onto a place. I’d happily eat it as a main meal, or as a side to some bacon chops. Spectre hates Mac and Cheese, but he likes Pot Noodles. 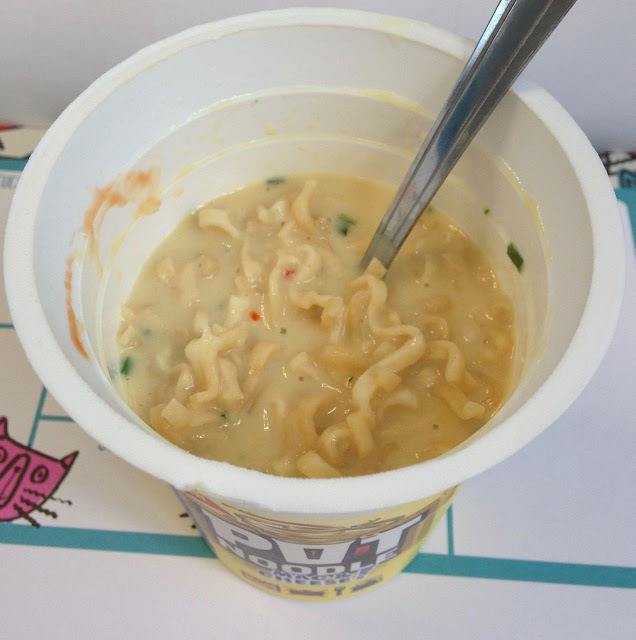 I added one of these new Mac n Cheese Pot Noodles to our grocery order with the assumption that he’d review it, but he suggested I take it work with me and have it at lunch. 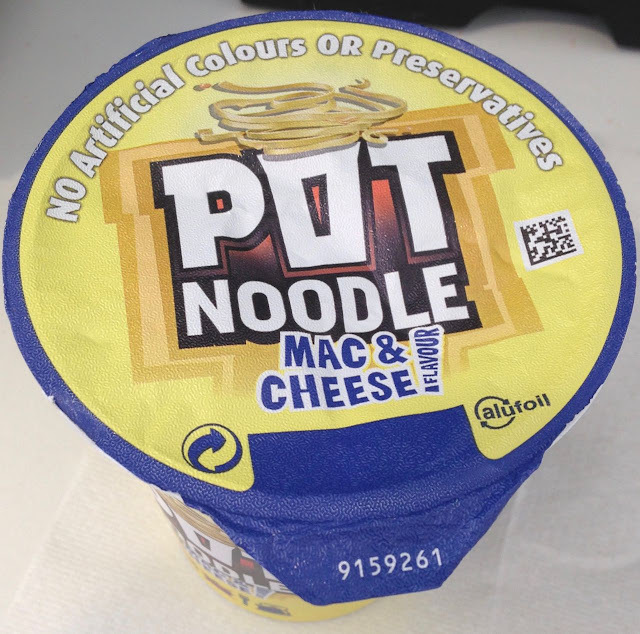 I have had few Pot Noodles in my lifetime, mostly as a student, but not for a long while. This meant I focussed more on the instructions than Spectre or a regular consumer would have. I opened the lid, removed the tomato sauce sachet and filled to the fill line. I didn’t think the fill line was that clear, but I went for the lower one that I could see. Then I stirred, added the content of the tomato sauce packet and stirred again. First things first, I’d assumed the pasta shapes would be macaroni, isn’t that the point? I’m assuming these are the regular pot noodle noodles though. Long, thin and flat. 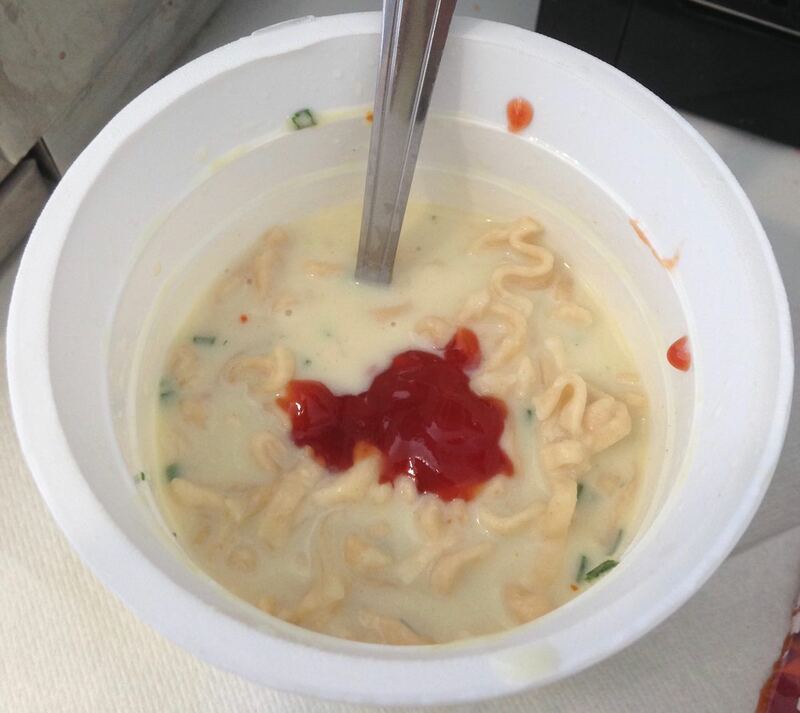 The noodles softened easily with the hot water in the preparation and the sauce thickened up nicely too. I liked the flavour, the cheese sauce was creamy, but had a nice depth of flavour. There was a hint of mustard and from the sauce a hint of tomato. 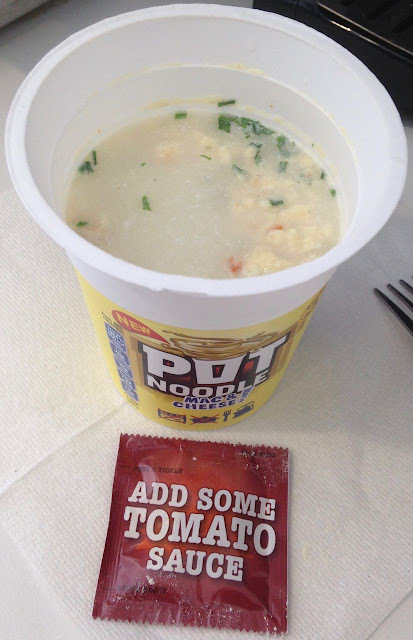 The chives and red pepper bits mixed up the flavour enough to make each mouthful interesting, and I was enjoying my Pot Noodle experience. IT was surprisingly pleasant. As I was at work, one of the ladies spotted me having my Mac and Cheese Pot Noodle and came to take a look, she immediately noticed the calories. There are 450 Kcal in the pot, which is quite a large amount for a smallish portion of noodles. As I much as I liked them, I didn’t think they were quite close enough to being Mac N Cheese to justify the variety title. I was naively expecting actual macaroni. This new Pot Noodle Mac and Cheese is probably something I’ll only have occasionally, when I know I’m going to be short for time at lunch.